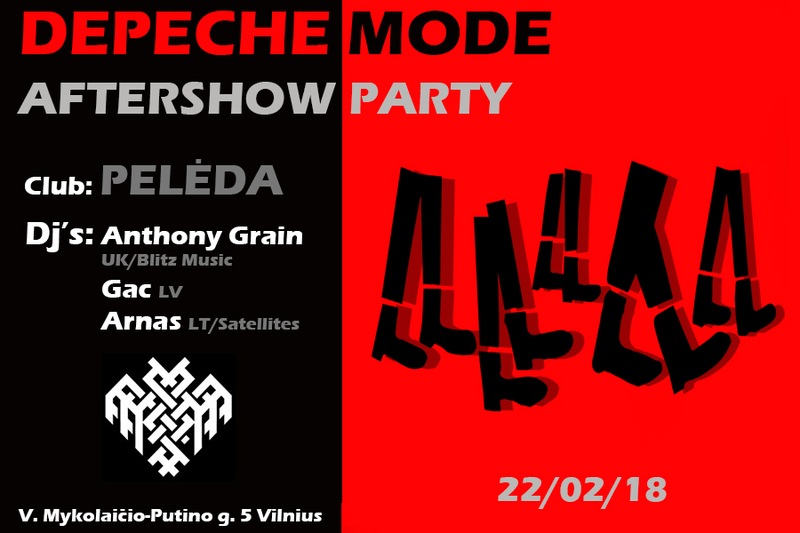 Our favourite band Depeche Mode will have gig at Vilnius Siemens arena on 22nd February 2018. Our goal is to organize not only a good after party but also bring together fans from all over the world who are visiting Lithuania. The party starts at 11:00PM and ends in the morning. DJ GAC (LV) will play an absolutely great set of classical and dance remixes from the 81st to the 17th years. Dj Arnas of SATELLITES will play almost all the great songs of Depeche Mode you may miss from the show and the best DM mixes. DJ TheNightHeDiedInside (Satellites) will bring you back to 80’s with dark glamour sounds of Depeche Mode, yet melancholic electronic DM disco music would ignite your SPIRIT and wouldn’t let you abandon dancefloor. Everyone is welcome! Come if you wanna listen to great music, meet fans of Depeche Mode, have a good time and dance the night away! Organizer: DEPECHE MODE FAN CLUB SATELLITES.